Hometown: I was born and raised in Mumbai, India. In 2016, I moved to the United States to pursue my graduate studies. Where are you working? Title? I work for Gaumard Scientific as an electrical engineer. The company designs body simulators for health care education and has been doing so since 1946. How did you get your job? I saw the job posting through FIU’s Handshake website. I felt I was a good match for the job so I went ahead and applied. On April 13, I went in for an interview at their headquarters, which is located near the Miami Executive Airport. The interview went very well. They were curious about a cortisol detection project I worked on during my master’s program. The cortisol detection device can help patients know the cortisol level of their blood at real-time. High levels of cortisol can cause negative health effects like heart disease. It was the only biomedical device I had worked on, and I was proud of it because I was there from the design phase to the launch phase of it. What was your greatest fear going into your first job and how did you face it or overcome it? I would say my greatest fear going into my first job after completing my master’s degree was going into a different work culture. I have work experience, but only in India, where I worked for an engineering company testing devices and programming water meters to detect the flow of water in pipelines. I was worried about what to expect working in a different country and culture. However, the employees of Gaumard are very friendly and have made me feel welcomed. What advice do you have for those beginning the job search process? Take advantage of FIU Handshake. It’s such a helpful tool because it provides FIU students and alumni with job postings, internship opportunities and career events taking place on campus. Handshake lets you add your resume, work experience, skills and interests, making it simple to find job postings related to your field. Also, reach out to companies you are interested in and attend FIU career fairs because most of the time recruiters from companies are in attendance. Even if you don’t get hired by them right away, it’s still a foot in the door. My last words of wisdom would be to connect with your professors and colleagues. For instance, I worked with Mubarak Mujawar, electrical and computer engineering instructor, on a project exposing me to the making of sensors. Besides teaching me technical knowledge, Mujawar was a good mentor by helping me develop and improve my resume and guiding me in my job search despite his busy schedule. It’s okay to ask for help from your peers especially when they believe in you and see potential in you. What does a day on the job look like? I recently started at Gaumard Scientific. My first day consisted of training and getting to know the company’s history, culture and their products. Their products are something out of this world. Last year, they created the world’s most advanced newborn simulator called Super Tory, which was developed to meet the challenges of neonatal care specialist training in real environments. Participants can train in familiar settings using the same tools they would on an actual newborn baby. This year, Gaumard created the world’s most advanced pediatric patient simulator called Pediatric Hal, helping future nurses and doctors develop the specialized skill set needed to communicate, diagnose and treat young patients in all clinical areas. The simulators are so lifelike and they are essential for future doctors, nurses and military to train on them. As an electrical engineer, I work closely with the team to continuously improve the products to meet the new guidelines of the American Health Association and other organizations. I get to be creative by designing and developing new embedded systems in the simulations and also improve older models with the mission of making the products more lifelike and with more advanced features. I meet with my manager often to discuss new designs, new approaches and receive feedback on the feasibility of the system. 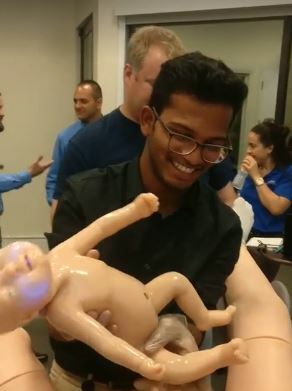 Aniket seeing how Gaumard’s childbirth simulator product works. How does your job connect back to your coursework? The courses related to design and real time computing and applications, mainly about programming and designing hardware, have been essential for my job. Also, this job is very team-oriented and during my master’s program, I worked closely with a group to work on the cortisol detection system I previously mentioned. 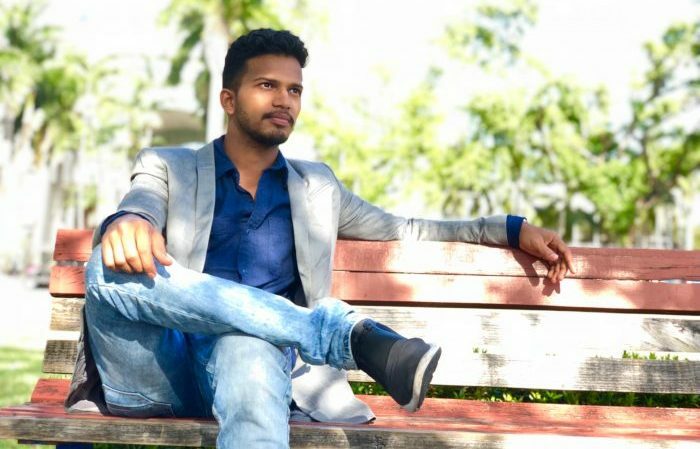 I worked with Khalid Pasha, electrical and computer engineering doctoral student and Renny Fernandez, post-doctoral research associate, under the guidance and mentorship of Shekhar Bhansali, Altacel-Lucent professor and chair of FIU’s Department of Electrical and Computer Engineering. We worked together to create a wireless enabled hand held device for cortisol detection. Fernandez presented the paper on our device at the American Chemical Society (ACS) National Meeting at New Orleans, which was a big achievement for us. I learned the meaning of teamwork with this project. How has your transition from school to work? How do you balance your time? Well, I took most of my classes in the afternoons and evening. Now I have a full-time job and I start at 8 a.m. so that’s a bit of a change for me, but I’ve gotten used to it. Also, in school you will always learn more theory than practical work, but nonetheless the theory is necessary in order to successfully complete assigned projects at work. What’s been the coolest thing about your job so far? The coolest thing by far has been getting the opportunity to see how the childbirth simulator product works. It actually delivers a simulator baby, which is as good as the real experience. I was somewhat nervous at first, but was amazed at the functionality of the products. I’m really excited to grow with this company.